Three years ago George and I did an insane long weekend break to South Africa only to narrowly miss out on riding what is arguably one of the most interesting looking coasters in the world. Since that time we've been wondering on and off how to get back. A dedicated trip was clearly out of the question; we'd already done that once, and there was no way we'd spend that sort of money a second time. However, we came up with a cunning plan, namely engineering a stopover on another trip to somewhere in the Southern Hemisphere. At this point it's probably wise to reiterate that I am in fact capable of reading a map, and that I'm well aware that Johannesburg isn't on the most direct path between Ireland and Australia. However, our round the world flight tickets were priced based upon the total miles used, rather than the number of flights. This meant that a stop in Jozi would in fact not cost us anything at all, bar the inevitable airport taxes. These added hardly anything to the overall cost of our ticket, and thus the die was cast. Prior to the trip neither of us had appreciated how popular the Heathrow to Johannesburg routing actually is. Amazingly there are four daily jumbo flights in each direction, which means well over ten thousand passengers per week choose to make this trip. Better yet, there are several daily services from London to Cape Town also, which only goes to show the size of the South African market. Gold Reef City is the only theme park I've been to that has its own hotel located physically inside the park. It was a pleasant surprise to be able to check in before nine in the morning, particularly since our rooms were ready to go. Half an hour later a superb catered breakfast had temporarily forestalled the effects of jet lag, and we were ready to explore the park. It was immediately evident that a number of rides and attractions had been rethemed or otherwise done up since our previous visit. The most obvious examples were the coasters, all of which were sporting new paint in different colours to what we'd seen before. One could scarcely miss the state of Anaconda, which had been partially painted bright orange, albeit with large chunks remaining to be completed. The multicoloured state didn't affect the ride quality in any way, however; in the back seat it was gloriously intense, just as I remembered, making it still far and away my favourite inverted coaster. In addition to the coasters several flat rides had either been moved or rethemed; the most obvious examples were the UFO and Dream Boat rides (see themeparks.ie for comparisons) but other changes had been made too. The appearance of the park was already above average on our last visit, and these incremental improvements have the potential to catapult it into the premier league. It is great to see management that is prepared to invest in getting the most out of what they have rather than looking for new attractions all the time. Golden Loop (#1111) appeared to have been repainted very recently, as the track positively gleamed in the morning sun. We were on the fourth train of the morning, and were more than a little disconcerted by the smell of burning brake fins so early in the day, even if it is entirely normal for this type of ride. Shuttle loops rarely disappoint, and this one was running very well apart from a minor pothole at the entrance to the loop. This brings me rather neatly to the Tower of Terror (#1112), the unique roller coaster that was one of the key factors in us deciding to visit South Africa three years ago. On our last visit the ride had just been closed for a lengthy rehab, which ended up taking more than two years. During this work the traditional lift hill was replaced with an elevator lift, and the restraints were replaced with over-the-shoulder harnesses. To begin with the positive, this ride is all about fear, and it plays on those emotions brilliantly. The single car shuffles out of the station and round a corner, banging slightly as it goes, which only serves to emphasise the vulnerability that passengers feel at this point. The car then enters an elevator lift, with the car again stopping very suddenly just as first time riders are sure the car is going to go off the end of the track. The lift is very quick indeed, putting the car at the top of the drop in only a few seconds. At this point the car inches forward at a snails pace, taking just long enough for the normally reserved South Africans to start screaming like there's no tomorrow. A few seconds later, they are muted completely as the car vanishes underground, and an eerie silence is restored. By the time the car reemerges into the light, however, everyone is smiling again (bar the occasional person who swears then and there that he or she will never ride that again). The tower was experiencing technical difficulties today, yet unlike so many other parks the crew kept the ride going since the problems evidently didn't have a safety implication. Only the front row of each car was being loaded, and even then the lift mechanism sometimes failed to catch. Staff members could be seen walking down the track to give the car a push. It's hard to imagine this sort of situation somewhere else; instead the ride would be closed outright. Full marks to Gold Reef City staff for working with what they have. Overall the ride would have rated about a nine out of ten for me were it not for the one major issue, namely the restraint system. 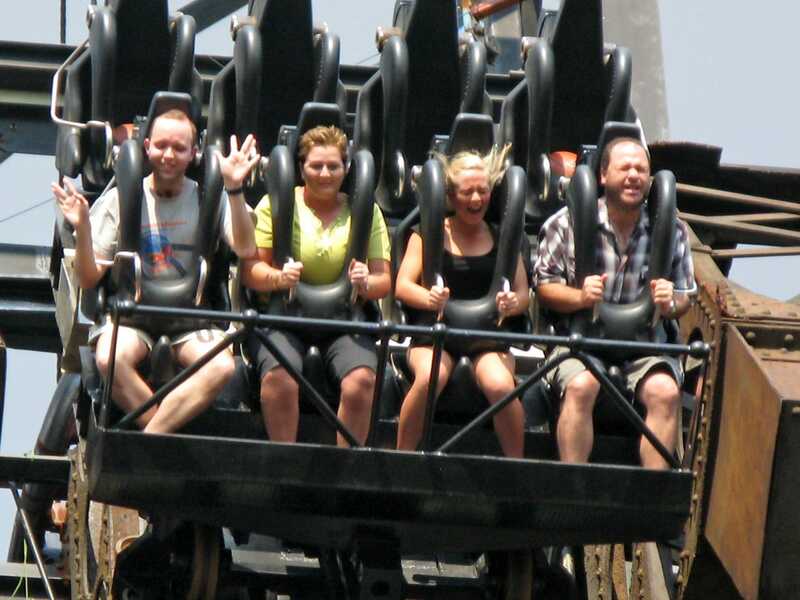 The over the shoulder restraints frankly hurt, particularly when the cars changed direction both during the drop and after the underground tunnel. If anyone from the park is reading this I'd strongly encourage the investigation of some softer padding; until then, it might be no harm to advise people to remove earrings. Jet lag precluded us from doing too much more today, though we did take a spin on the Jozi Express to see how it was ageing. It was definitely more bumpy than I remembered, but having said that it was brand new on my last visit, so that is probably inevitable. We also tried the recently refurbished 4D Theatre; the film in use was the standard Panda Vision one, which we both enjoyed.